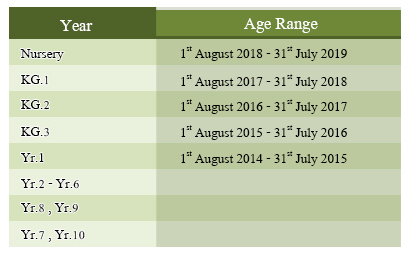 For the academic year of 2019, the school has a policy to give a 30% discount on tuition fees (no discount on other fees) to the first child of any family who currently has three children studying at Sarasas Ektra School. For all applicable families, parents can bring the birth certificates of the three children from the same family to the admin office to submit their request for a tuition fee discount. All students who wish to apply for a scholarship must follow the rules and regulations of the school. Furthermore, parents should have a good attitude towards school and always cooperate and support school’s policies. 1. Please prepare all documents and fees to enroll the student on the appointed date. 2. A parent must be present when enrolling the student at the appointed date and time. (Except NC.-KG.3) Please call to make an appointment 1 day in advance. • •Summer school is compulsory for all the new students. Course equipments and school uniform can be purchased during summer school. • •Payment for summer school, air condition charge, Summer Course and registration fee must be made in cash only. • •Entrance fee, school fee and science equipments can be made in cash or cashier cheque. Within 7 days after announcement of result.